The Arts, Civic Engagement, and Urban Youth explores methods for using the arts as a vehicle to empower urban youth to become critically engaged in their communities and positively improve their quality of life. Barriers that prevent urban youth from critically engaging social injustices and inequalities are examined and arts-based responses offered. An arts-integrated methodology is woven into previously researched and proposed pathways to civic engagement in order to offer urban youth opportunities for hope and healing from chronic adversity. This arts-integrated methodology facilitates in the development of self-efficacy and knowledge for youth to successfully affect sustainable change in their communities. Media venues are teeming with feel good stories of youth engaged in public art and arts-based community service projects. The youth group that painted a mural on the side of the community center that was on the brink of closing forever. Exhibiting photos taken by children that visually convey the dangerous areas of their neighborhood. The concert of youth created hip hop that shares their daily struggles with oppressive poverty that they cannot escape. A play performed by elementary students for an audience of local politicians to highlight the importance of arts education in their public school curriculum. Viewing these stories provides a momentary surge of pride that the youth are giving back to their community and builds hope for these future community caretakers. Yet the more cynical viewer might question how involved the youth were in the project. Did they originally identify the issue to be addressed? Were they asked for input on solutions to these issues? Are they leaving the project with more than they started? Could civic engagement provide opportunities for personal transformation alongside social change? Without over-simplifying the matter, it would appear that disadvantaged urban youth would appear to have more opportunities for civic engagement than suburban or rural youth if for no other reason than the environment in which they live. Many face racial injustices, intergenerational poverty, violence, and under-resourced schools and community centers on a daily basis. Families are threatened by unemployment or underemployment and lack of quality healthcare. (Ginwright & James, 2002; O'Donoghue & Kirshner, 2003) These issues are woven into the very fabric of their community, threatening community well-being and decreasing healthy development of young people. Issues of adversity can become a perpetual cycle with urban youth being born into adversity, struggling to survive and thrive under the oppression, and eventually giving up hope and allowing the cycle to begin again with the next generation. So why, with so very many issues to overcome, would urban youth not do all that is within their power to create change in their community and demand a brighter future for themselves? The urban youth described in the case studies found later in this chapter are fortunate to be involved in a community art center, afterschool program, and school that provides opportunities for self-development and community engagement. Unfortunately, most urban youth do not have similar opportunities. More frequently, urban youth lack access to opportunities to participate in addressing the rising poverty, joblessness, violence, and inequality plaguing their communities. Public schools offer little in the way of educating students on the democratic process or providing skills necessary to organize and mobilize on behalf of public interests. Youth seeking to confront inequalities and injustices are often dismissed because of their age or because they are viewed as “part of the problem.” With so many obstacles to becoming civically engaged, it is no wonder that urban youth begin to lose hope for their futures. Yet, perhaps not all hope is lost. Arts-based civic engagement not only offers a voice to those seeking to address social injustices, but a pathway for building self-identity and efficacy along the way. When youth are engaged in arts-based civic engagement, their comprehension and ownership of issues and challenges is stronger. They develop a deeper understanding of social issues and awareness of the root causes of injustices and inequalities. They develop skills that are less frequently taught in school such as creative problem solving, collaboration, and cross-cultural communication that promote the development of creative solutions to social problems. When urban youth contribute to community change through the arts, their social concerns are heard by more adults and the larger community, and their creative ideas are validated. Further, youth who are engaged in the arts are more likely to volunteer in their communities into their adulthood than youth who do not. (Borrup, 2009; Caterall, 2009) Soon they find strength and confidence in their voice which prompts them to continue to spiral upwards, expelling injustices, and eventually and hopefully, breaking through the cycle of adversity. (Innovations in Civic Participation, 2010, p. iii) Through the art-making process, urban youth are able to remove the labels placed on them by life’s adversities, and begin the process of healing. With healing, hope is restored and youth become empowered to confront pressing community problems. Urban Youth: For the purpose of this chapter, urban youth will be defined as young people between the ages of 12 and 18 living in an urban context. While significant diversity exists in urban communities, the contents of this chapter offer a greater scale of influence for those youth living in distressed neighborhoods and are consistently marginalized from society due to race, income, and lacking opportunities. Adversity: Issues present in one’s life that affect quality of life. Hope: The expectation of positive outcomes related to events or circumstances. Arts-Based Civic Engagement: In arts-based civic engagement, art-making and the creative process are the vehicle driving the civic engagement process or project. 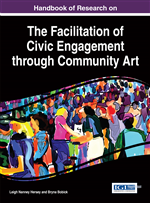 Participants in arts-based civic engagement may either use an arts performance or exhibition to call attention to the issue to be addressed or explore the issue to be addressed through the process of making art. Social Toxins: Chronic instances of adversity rooted in social injustices that prevent healthy development. Community Arts: Art-making in any media, genre, or discipline with the goal of engaging artists with the community to facilitate creative explorations that support development and improve quality of life.